Economists predict people will scale back their spending this holiday season, but Iowa growers say people are still cutting down and not cutting out their Christmas trees. Jan Pacovsky is the executive director of the Iowa Christmas Tree Growers Association, and says so far the economy hasn’t seemed to impact those who like a real tree. Pacovsky says live trees are one of those things that are a tradition and don’t seem to be impacted. Pacovsky says selecting a live tree is an experience the many families view as an important part of the holiday. Pacovsky says most of the Iowa growers are “chose and cut” family operations and they have a lot of families who bring their kids out and pick out their tree and cut it down and take it home. She runs Pine Acres farm in New Hampton, and says locally grown trees give you the advantage of knowing where and when they were cut. She says they don’t cut down trees until they are chosen, while she says trees on lots can be cut down in October and put in cold storage. Pacovsky says the trees on the lots can become dry much quicker if they are not properly taken care of. Pacovsky says the trees that are on lots sometimes give local growers a bad reputation. She says people will not want a live tree because they are afraid they will start a fire. Pacovsky says if you take care of your tree, it will not start a fire. While the wet weather set back corn and bean farmers, Pacovsky says the trees did well in the weather. 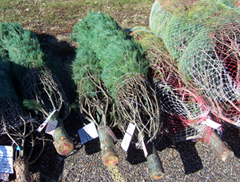 Twenty-seven growers recently donated 125 Iowa trees to be sent to soldiers in the “Trees for Troops” operation.